This post originally appeared on Medium, and is written by the CEO and founder of Storyzy, which tracks fake news and extremist websites. Google is funding extremist and fake news sites through AdSense, its platform dedicated to publishers, despite its own policies. This is because it only removes ads at the page level. Analyzing the 700+ fake news sites* on its automated blacklist, Storyzy found that 90% of those using programmatic ads are affiliated with Google AdSense. If you are a brand and you do not want to create revenue for extremist and fake news sites, perhaps the only solution is to blacklist the whole site. In concrete terms, a given brand’s ads may have been removed from pages with racist content on an extremist site but still appear in its weather forecast section, meaning that Google and the brand are providing revenue to such sites. So it is not a surprise that, in September 2017, 90% of fake news sites which are monetizing their audience through programmatic advertising are using Google AdSense (according to Storyzy statistics). Their audience represents 120 million monthly visits. Since July 2017, Storyzy spotted on these fake news sites more than 600 different brands’ ads, including big names such as McDonald’s, Walmart, AT&T, Adobe, Visa, Nespresso, American Express, Verizon, Hertz, Volkswagen, Goodyear, Microsoft, Dell, Toyota, and others. However, when a brand’s ads appear on specific “safe” pages of an extremist site because those specific pages do not violate Google policies, the brand is still funding both the extremist site and Google. Are Google’s Rules Wrong At Page Level? It is public knowledge that Breitbart.com has been blacklisted by nearly 2,600 brands since November 2016 (that applies to the entire site, not only specific pages). 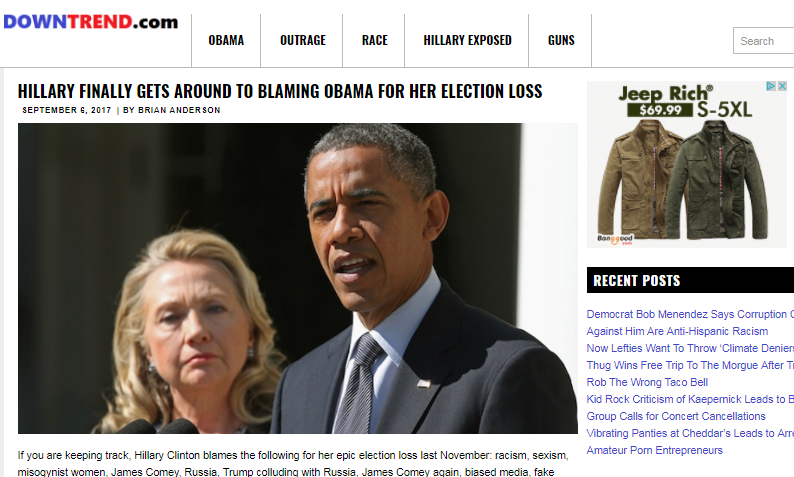 Not all content on the site is extremist, racist, or contains false information. These brands removed their ads despite the fact they could appear alongside articles from respectable agencies like the Associated Press. 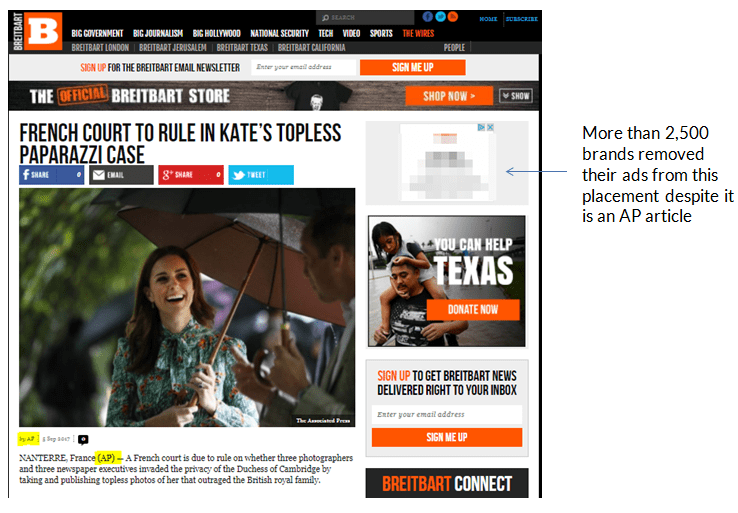 For example, in the screen shot below you can see an AP article on Breitbart that has been blacklisted by these brands. So what is the best approach for a brand? Removing ads from the entire site, or just from certain pages? Nearly 2,600 brands chose the first option, probably because they do not want to fund Breitbart. So if you are a brand and you do not want to create revenue for extremist and fake news sites, perhaps the only solution is to blacklist the whole site and not only its pages that violate Google AdSense policies. To be fair, Google says it can sometimes remove an entire site. However, we have noticed that 90% of extremist and fake news sites are running programmatic display ads, including Breitbart, which are still affiliated with Adsense. If brands want to control their ad placement, they cannot rely only on Google. They should additionally use a real-time dynamic blacklist of sites where they do not want their ads to appear. This will provide a real-time update, which is necessary because sites are emerging, changing their domain name, disappearing and coming live again all the time. For example, thanks to our algorithms at Storyzy, we detected this week that the neo-Nazi site The Daily Stormer has become live again under another domain name. In addition, an automated blacklist is run by algorithms that are politically neutral. *The Storyzy fake news sites dynamic blacklist includes 9 categories: false information, extreme right, extreme left, conspiracy, propaganda, hate, pseudoscience, satire and clickbait. Stan Motte is the co-founder and CEO of the tech start-up Storyzy, which was founded in 2012 with the goal of fighting misinformation on the web, first with an automated fact-checking tool, and today with an automated way to detect fake news sites.